The first step in improving a familial relationship is understanding what causes the dysfunction in the first place. With approximately 42 percent of marriages ending in divorce, nearly 679,000 children in the United States suffering from abuse and neglect each year and approximately 20 percent of teens experiencing depression, familial dysfunction is at its peak. 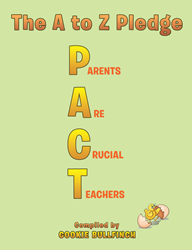 In her new book, “The A to Z Pledge Pact,” author Cookie Bullfinch provides readers with a tool that promotes healing and opens lines of communication between parents and children, teens and young adults. Bullfinch inspires readers to be confident and in control of themselves, and reinforces the benefits of positive reiterations. For more information, visit cookiebullfinch.com. Cookie Bullfinch is a mother, grandmother, hypnotherapist, Reiki Master and volunteer. An avid lover of children of all ages, her passion is in understanding children’s’ minds from in utero and beyond. After many years of dedication and immense love and affection, she finds herself in a place where she is able to help parents and children worldwide. She says “The A to Z Pledge Pact” is truly her heartfelt story of how simply one’s life can transform into something so beautiful and meaningful.